LSU Health Sciences Center specializes in teaching, research, & health care function for students looking to pursue a career in health care. Their main areas of education are in the nursing & dentistry field. The existing lighting in the student parking lots consisted of (145) Area Lights which housed 1,000 watt metal halide bulbs & ballasts. This setup did not provide the necessary lumen output to ensure the safety of the students walking to their vehicles at night. The high wattage bulbs & ballasts were also constantly burning out & in some cases melting the existing wiring inside of the fixtures. 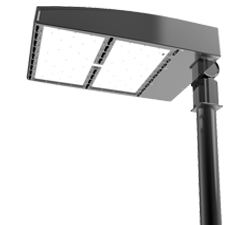 Our proposal consisted of changing the 1000W metal halide area lights to 230W integrated LED area light fixtures in order to provide more lumen output, save maintenance costs, & energy costs. After our installation of the (145) 230W Area Lights LSU HSC noticed an immediate difference in the light output of the new fixtures. Not only were the new fixtures brighter, but they also covered more area than the existing fixtures due to the new light distribution. LSU HSC is now saving close to $50,000 annually on their utility bill & over $20,000 annually on bulb/ballast replacement & maintenance. ampills.com. They will be able to return their total investment in less than 3 years. After our installation of the (145) 230W Area Lights LSU HSC noticed an immediate difference in the light output of the new fixtures. Not only were the new fixtures brighter, but they also covered more area than the existing fixtures due to the new light distribution. LSU HSC is now saving close to $50,000 annually on their utility bill & over $20,000 annually on bulb/ballast replacement & maintenance. They will be able to return their total investment in less than 3 years.